It was a beautiful weekend in NJ and the week has slowly turned hot and humid, ICK!!! Well things are progressing more and more with the house. The corbels are hung and I love what they add to these large doorways. I can’t wait to see them with the furnishings, Furnishings! Boy, we will have to get acquainted; we haven’t seen each other in a year LOL. It is amazing how much you can miss your things over this much time. The appliances are in, YAY, so happy with everything we purchased. The quartz counters have been templated and will be installed on Monday. The hardwood floors are getting stained this week in dark walnut and John and I can’t wait to see them. We are going with a matte poly finish. All the plumbing is in, the electricity is working, the toilets are in place and flushing!! I had to christen one while we were there this weekend, LOL. 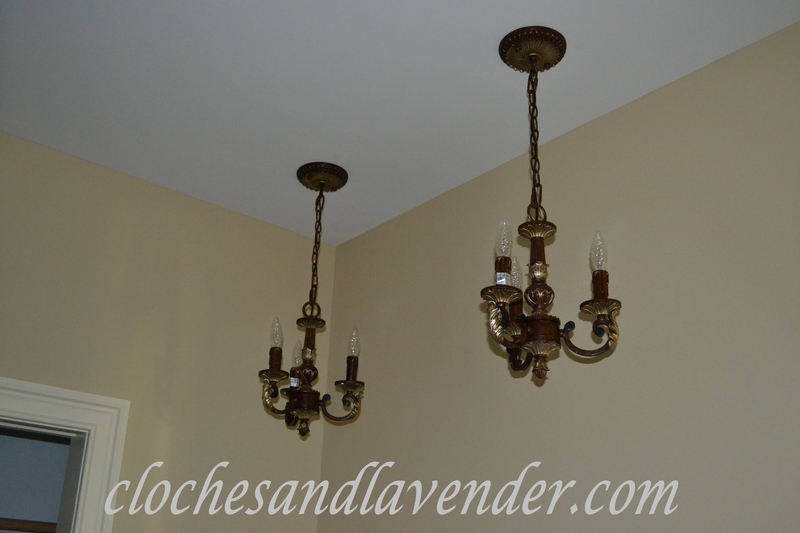 The vanities and faucets are beautiful and I thought I would give you a peek at our gorgeous lights in the master bathroom, one over each sink. Are these GORGEOUS or what, LOVE!!! The air conditioning condenser is in place outside, which I am sure the workers will be grateful for while doing those floors. The grading of the yard will be getting done which is great for Peanut and Reeses so we can begin getting their own personal area ready for them to do their business and be able to romp when home alone with momma. They will be doing this with me watching of course, safety first, LOL. June 24th is approaching quickly. Many little things still need to be finished. The finishing touches are wonderful!! So exciting! You are now in the home stretch. I really love those corbels and light fixtures you chose. Can’t wait for the grand tour soon. I can’t wait to show everyone everything. This home just screams us and everything is just what we wanted. I am very happy with the corbels they add s uch a great touch and those lights, well I could go on for a week! 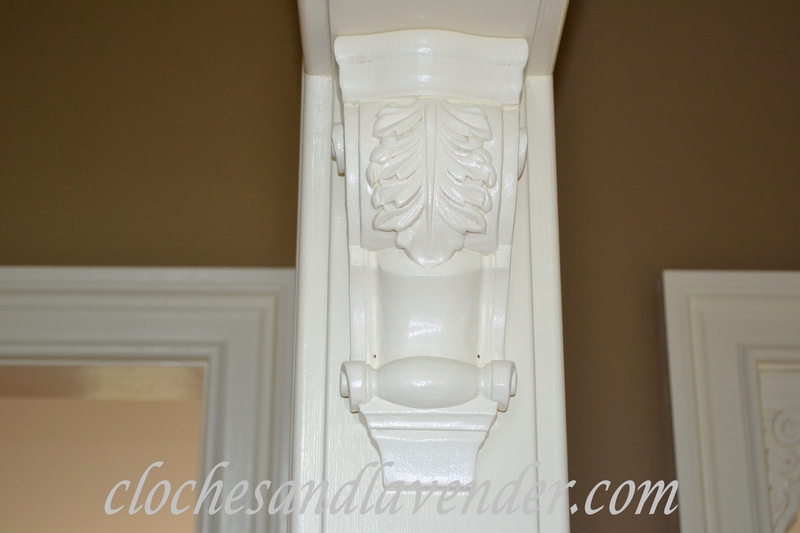 LOVE the corbels and LOVE those little chandies in your master bath!! You must be so excited!! Thanks so much Martina and I am very excited. When I go to the house I go look at those lights twice, LOL. Hooray! Your excitement is palpable!!! I can’t blame you a bit. I know I’d be just about able to chew railroad stakes in anticipation!!! Hang in there…just about another week! Thanks Alycia and I am driving John crazy because I am so impatient at this moment. Like a kid getting ready to go on vacation. All seems to be on schedule! I love the corbels I have always thought of doing those in the doorways. I would love to know on a future post why you went with quartz counter tops, mat floors…you have learned so much in your building of this house you just have to share…The trends the choices and what is new. I am thinking about remodeling my kitchen and trying to educate myself…Thanks for sharing! Carol, it is funny you brought this up, I am going to write a post about why I chose quartz over anything else and speak a bit about what we did this time over building our first home. I think I am going to do that once the counters are installed Monday and more of why I chose the tile I did, etc. Thanks for your continued support! It is looking great. Love the chandy’s over the sink and the corbels are awesome. So close I bet you are over the moon excited. I am so excited you wouldn’t believe it. The idea of decorating and doing projects has me so happy. I love those lights so much it is questionable if I am sane right now, LOL! The corbels look fantastic! It’s really getting close! I know it is so close I am ready to explode, LOL. Thanks so much Amy. Your new home is looking gorgeous!!! Thanks so much Mary Alice, I can’t wait to add my touches and really get decorating. The boxes may hold that up for a bit, LOL! Cynthia, it’s wonderful to see your personal touches! I love the corbels and the lights are fabulous! Your new home is really starting to shine! Thanks so much my friend, I am so in love with those lights. It is quite sick, LOL!!! We had Corian in the other house and it was the rage in the 90’s. Served us well but quartz has no upkeep and you can clean it with anything and it is sturdy as anything. As I listen to your list of what has been accomplished, I am overwhelmed and admire you. I don’t think I could go through all the stages of building a house. I love doing this and I am so fortunate that this is t he second time. I learned so much about what mistakes not to make from the first build. For some reason you comment went into spam and I just discovered it, sorry. I have some IT work when we get settled. no only i do love the corbels–your woodwork is beautiful! darling chandys in the bath, too! Thanks so much Lynn for stopping by and I am in love with t hose lights. Oh I bet you can’t wait till June 24th!! !….how exciting and everything looks great! I am counting the days and I can’t wait to be creative again!! Sooooo wonderful…….everything looks so pretty! Thanks Susan, when we go to the house I am thrilled with everything we chose but I just go back and look at those lights over and over. Everything is beautiful – love the chanty’s over the sinks. I know you are so excited to be this close to move in. Can hardly wait to see the final review. I can’t wait to make everything pretty and get decorating. A year is a long time. I have projects that I have planned to, to get going. It will be great t o be creative again! Cynthia…I bet you are on the edge of your seat waiting for the finishing touches on your home. The corbels look great! I love the master bath lights too. You were smart to go with a matte poly over your dark floors. It looks so much better and shows way less dirt than a glossy finish. I so agree about the poly, it’s much better for hiding scratches too. We did the one floor we redid before we sold and we loved it so much. I am so edgy about getting in there. Next week, so fingers crossed that we get the CO. We just need t he floors t be done and the counters in place and we are good to go. I love corbels and hope to get them up on our porch posts this summer. Aren’t they such a pretty touch! Oh my, it is getting so exciting! Love, love the corbels and toilets in place is always a good thing. lol! You’ll be in and back amongst your wonderful things before you know it! I can’ wait Jann!!! ! 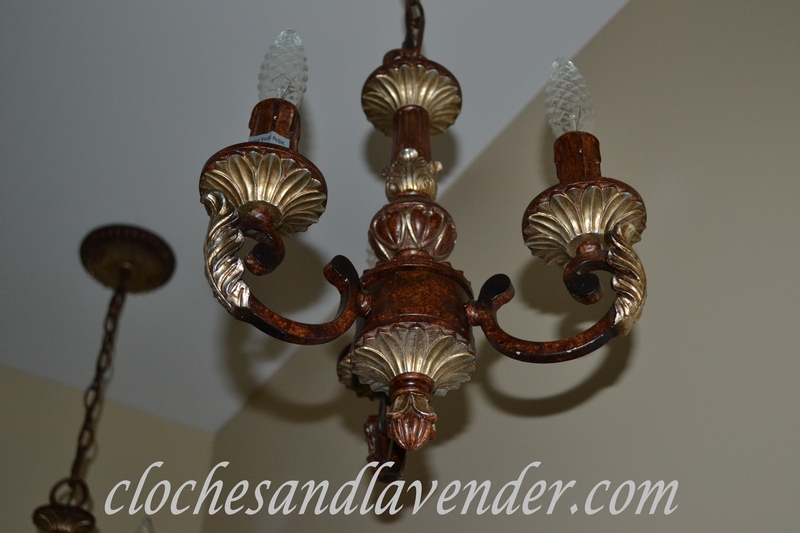 The corbels, the chandeliers, what pretty details you’ve chosen for your new house! I can’t wait to see it furnished and ready for you to move in. I bet you can hardly sleep at night just thinking about the big day! Hi Vickie, I really can’t wait to get in and get settled. I miss doing all the things that I normally would be doing. Thanks for the visit! I am happy you came to check what’s been going on and I don’t know why you aren’t getting posts. Some have been going in spam as far as comments. Once settled my hubby is going to help me with some IT stuff. 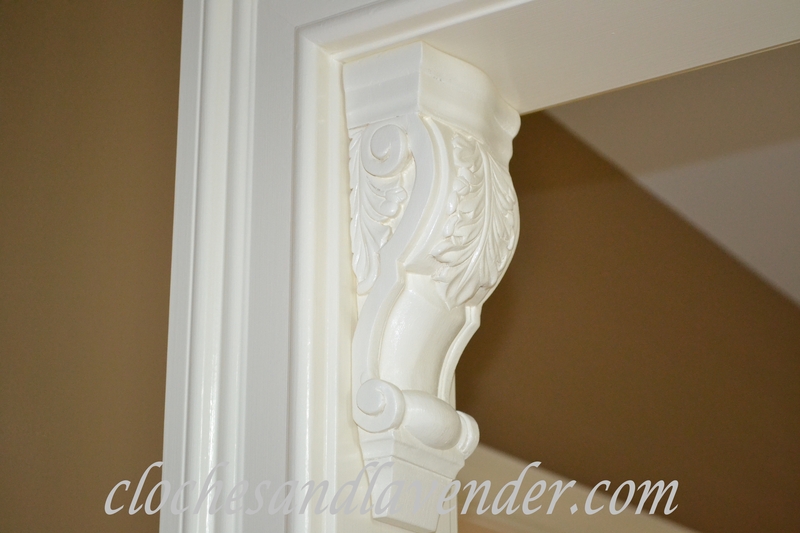 I have a definite love affair with corbels and yours are gorgeous! I’ve really been enjoying watching the progression of your house. You are at the really fun part, for sure. I can just imagine how excited you must be to get moved in. I am beyond excited, I can’t wait to my stuff and unpack and then decorate and I have projects I want to do too!! I can’t wait to be creative again. Thanks Suzy for hanging in there through our build. Oh this house is going to be an absolute show stopper – you must be over the top thrilled with everything !!! Oh I am so far, the floors look gorgeous and the quartz got installed this morning. In the house Friday, I can’t believe it, it has been a year!!!! Thanks for always being here my girlfriend!!! !